As one of the higher-placed teams from last season, Nottinghamshire 1 had the luxury of a relatively easy first round match against Celtic Tigers 2. Averaging over 200 Elo points per player more than our opponents, we were keen to post a big score – especially as there are only two promotion places available this season. However, things didn’t quite go to plan at the start. The problem was simple enough: David Levens’s morning commitments meant that he was cutting things a little fine in terms of getting to Birmingham in time for a prompt start. He also had to pick up the Lakhanis, but with the 4NCL’s generous time controls, arriving five or ten minutes late is not a big problem. Unfortunately, things didn’t go quite to plan: a missed turning and heavy traffic saw Kishan and Anjali arrive 35 minutes late, with David another five minutes behind them after parking his car. Nevertheless, David found himself in familiar opening territory and was rapidly catching up with the clock when disaster struck: his mobile phone rang and he was defaulted. This could have affected the rest of the team, but if anything it had the opposite effect. I won quickly to level the score, Andy Walker made it 2–1, and Richard Truman played a nice positional game to reach a won rook ending. His opponent promptly committed suicide by exchanging off the rooks: 3–1. Pete won by 42... f4+! 43. Kxe4 Nf2+ 44. Kd5 (if 44. Kxf4 then 44... Nh3+ 45. Ke3 Re7+ 46. Kd3 Nxg1 is equally hopeless) 44... fxg3 45. Kc5 g2 46. Kxb4 Nh3 47. Rxg2 Rxg2 and Black won shortly afterwards. However, with this position you get two for the price of one, since in the diagram position Black has another brilliant win (found by Fritz): 42... Rxg3! 43. Rxg3 f4+ 44. Ke2 (44. Kxe4 fxg3 45. Kxd3 g2 wins) 44... fxg3 45. Kf1 e3 and a pawn will queen. That left Rob Richmond to finish things off. At an early stage it looked as though he might break through quickly, but obdurate defence by his opponent kept him at bay for a long time. Eventually, though, Rob’s rooks invaded and a 5–1 result was sealed. Nottinghamshire 2 faced a much sterner test, giving away an average of 160 Elo points per board. That’s a little misleading, as the average was depressed by Anjali’s FIDE rating, which is way below her real strength. Nevertheless, it was a tough draw. The team got away well, with good wins by Bob Taylor and Neil Graham (whose opponent chose to play on in an endgame a rook down, with no counterchances). Kishan made light of his time deficit to register a solid draw on top board, and suddenly a big upset seemed possible. However, Anjali’s ultra-sharp opening went awry and gave way to a bad position and severe time trouble, and despite fighting hard she had to give way. Maurice Hill seemed to have things under control, but an advanced pawn slipped away, leaving him in a passive minor piece endgame. He successfully reduced the position to opposite-coloured bishops, but his 11-year-old Venezuelan opponent (graded 170!) showed good technique to claim the point and equal the score. All of which meant that the team’s fate rested on Richard Webster’s shoulders. An unclear position eventually resolved itself into a roughly level rook ending, at which point everybody else left for home. Richard fought on for around 6½ hours in the end, and was apparently lost on a couple of occasions. Ultimately, he found the route to a draw, and the day ended with both teams well satisfied with their efforts. After the successes of Day 1, both teams were optimistic about their chances on the Sunday. Indeed, things started well. True, Tony did make a catastrophic blunder in a good position that cost him two whole pieces, but my game (after surviving a nasty but ultimately harmless tactical shock) quickly resolved itself into a completely won ending after my opponent misjudged the relative importance of a rook on the seventh versus some shattered pawns. Rob also won quickly, so the first team were looking good. David had a significant advantage, Pete was level and Richard Truman’s game was complex but clearly OK for him. Unfortunately, Richard missed a win and then reached a very nasty position in which both players had chances but his opponent had the initiative. Richard used a lot of time, missed the best path and lost. Meanwhile, Pete was in trouble and quite relieved to be offered a draw, so the match hung on David’s game. Despite being on top, David’s pieces were a little uncoordinated and there were a number of weak points that he had to defend. Again, a lot of time was consumed, and in the end the advantage drifted away and a draw was agreed, leaving the match a disappointing 3–3 draw. Notts 2 also started well. Neil Graham picked up a second win, and although Richard Webster’s Grunfeld had reached a very drawish position, it looked as though Bob Taylor, Stan Cranmer and Maurice Hill were all doing well. Then everything started to go wrong. Stan’s queen was trapped, Maurice missed a win, and Bob’s position turned against him. Suddenly a likely three points had turned into two defeats and a probable draw. Meanwhile, John Harrison couldn’t fashion any winning chances, so Maurice needed to win to rescue the match. Sadly, it wasn’t his weekend. Trying too hard to win he lost the exchange and resigned in a hopeless ending, leaving the match result a disappointing 4–2 defeat. Neil’s game provides the entertainment. It’s not entirely sound, perhaps, but it’s definitely worth playing through. Tony Wright had a hell of a time getting enough people to travel south for the first long-distance weekend of the season. Richard Webster had long been known to be unavailable; David Levens needed a break after a long series of weekend commitments; and various others simply couldn’t spare the time. Appeals were made via Notts News and directly through the mailing list, resulting in Richard Myers coming on board, and finally we stepped outside of Nottinghamshire to sign up CJ de Mooi, who had advertised for a team to join on the 4NCL web site (my brother happens to know CJ quite well through the quizzing world). That still left the second team a player short, but at least things were not as bad for us as for at least one other team, who had to pull out completely. (The 4NCL really does need to address the southern bias in its venues – travelling from anywhere north of the Midlands is becoming impractical.) Then, late on Friday, Neil Graham was discussing a separate matter with Tom Day and discovered that not only does Tom now live in London, but that he was not registered for the team he played for last season. So we finally had a full complement. On to the chess. Littlethorpe 2 were responsible for Nottinghamshire 2’s defeat in Round 2, so honour was at stake. It helped, of course, that we had an advantage of almost 200 rating points per board. Quick wins for Richard Truman, Tom Day and me put us well on course, but the other three games were less clear. Rob Richmond was heading for a rook ending with level material, Pete Mercs was in trouble, and Tony Wright was making no headway. Pete lost, but Rob correctly judged that his connected passed pawns in the centre were better than an isolated passed rook’s pawn and brought home the victory. Just as well – Tony had pushed too hard, overlooked a tactic and dropped the exchange. The second team were actually facing stronger opposition than the first team, but that doesn’t seem to bother them at the moment. After Neil’s game petered out to a quick draw, Richard Myers picked up a straightforward win on his debut, while our other newcomer, CJ (yes, the one from the Eggheads quiz show), earned a hard draw on top board. It was his first game following a four-year break from chess – not a bad result at all. A win for Bob Taylor and a draw for Maurice Hill sealed the win, and it was then only a question of what the margin would be. 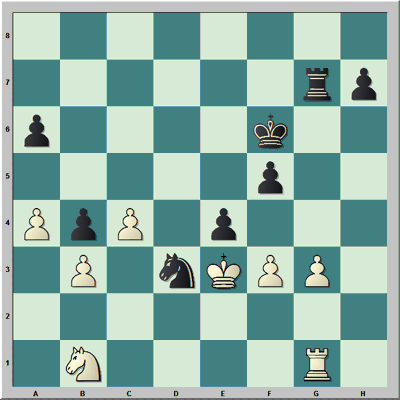 Brian Thompson’s position had definitely been worse at one point, but after about 4½ hours he had reached an endgame in which the general view was that he didn’t stand worse, and might have reasonable winning chances. It looked like the kind of game that might go on for some time, so the rest of us headed off for dinner. Maybe we should have stuck around – shortly afterwards Brian stumbled into a combination that ended with a knight fork and lost. The first team were very confident on the Sunday. We’d moved up to third place and had managed to avoid the top seeds, being paired instead against the Gloucestershire Gambits. That, unfortunately, was as good as it got. I probably managed to set the tone by forgetting my opening theory and getting a difficult position early on. Pete drew, and for a while things looked OK everywhere except on my board. But then, just as I was getting back into things, Tom dropped a rook (although he still had some attacking chances), and Tony managed to match him (but with no compensation). Just to make things worse, I missed my one chance for an advantage and ended up in a losing position with two rooks and a bishop against a queen and bishop. On a bad day, my opponent might also have spotted that he could also pick up my bishop as well, but he played for mate instead. Somewhat miraculously, I always had just one move to keep the position from being resignable, so I kept playing. Tony lost, but Tom’s opponent didn’t seem to want to finish him off. Rob won a pawn (some good news at last), and Richard liquidated to what looked superficially like a good B vs. N ending. Unfortunately, he found himself dropping a pawn and had to resign. Rob won his endgame (now the only member of the squad with 4/4) and I cheekily offered a draw. It was declined, but a few moves later, after finding no way to improve his position, my opponent returned the offer. Since I was in fact dead lost, I took the draw. Amazingly, Tom was still fighting on. I think we all knew it was hopeless, although his girlfriend Katya (from Moscow) remaining touchingly optimistic. Tom stuck it out until all hope was gone, but eventually had to throw in the towel. Nottinghamshire 2’s reward for beating strong opponents was to be drawn against the relatively weak Oxford 3. A reverse was surely coming after Saturday’s heroics, and so it proved. I have to admit that I saw very little of this match, what with having to spend most of the afternoon grovelling in my own game and not actually playing in the same room, but I do know that it went to the last game, which I think was Maurice’s. Brian recovered well from his Saturday mishap and CJ was more solid but could only draw. The third weekend of the season went reasonably well for the two Nottinghamshire teams. In Round 5, Notts 1 had a relatively easy pairing against Oxford 3, and wins for Ian Kingston, Richard Webster, Pete Mercs and Andy Walker contributed to a comfortable 4½–1½ win. The only real surprise was Robert Richmond’s failure to win a bishop vs. knight endgame with an extra pawn. Notts 2 started brightly against a much stronger Littlethorpe 1, with a quick win for Stan Cranmer, but nobody else was able to win and they ended up losing 3½–2½. 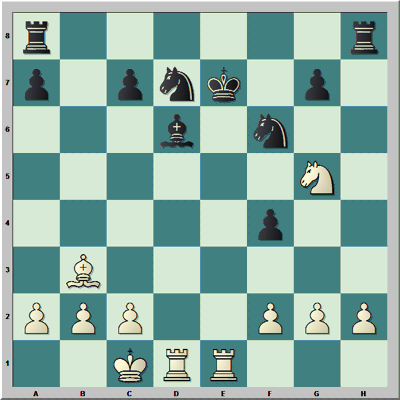 The critical game was Neil Graham’s: he established a winning position before time trouble struck, but once the time control had been reached an apparently straightforward R + 4 vs. R + 1 ending turned out, incredibly, to be only a draw. Who says there’s no luck in chess? In Round 6 Notts 1 faced Athenaeum. Although the Nottinghamshire side had the higher average rating, this hid the fact that this was entirely due to the 330 point difference on bottom board – over the other five boards Athenaeum were slightly stronger. Richard never had the better of his game and drew fairly early, but then the unthinkable happened – for the first time in two years, Rob lost. David Levens was winning at one point, but it went wrong and he was fortunate to get a draw. Andy won his game after a time scramble at the first time control. And that almost guaranteed bottom board win? Well it eventually arrived, as I picked up three pawns on the way to a simple rook ending, but my opponent bizarrely played on to mate, making this the penultimate game to finish. That secured a point, but Pete’s gambit idea failed and he lost, leaving the match tied at 3–3. The second team had a relatively easy ride against Guildford ADC 5, beginning with wins by default on the bottom two boards. Bob Taylor and Will Place both won and the team coasted to a 4½–1½. The results leave Nottinghamshire 1 riding high in third place – a somewhat misleading position, since we have yet to face any of the other top seven teams. Nottinghamshire 2 are just below halfway, in 18th place. Nottinghamshire 1 had the hardest possible draw for Round 7 – the division leaders Brown Jack, winners of all six matches to date. Outgraded on every board, the team nevertheless started well, with Richard Webster and Tony Wright securing quick draws. By that time (after a rather slow 10 moves) my opponent had contrived to blunder by threatening mate in one, which must be something of a rarity. 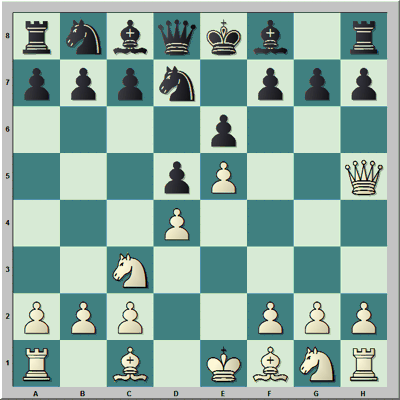 My reply, defending against the mate and in turn threatening mate in one, prompted a 52 minute think in an effort to avoid losing material, but to no avail; although the win did not arrive until move 54 it was never in doubt. While I was grinding out a point, Pete Mercs drew but Rob Richmond lost – about which he will allow me to make no comment. (Consult the match details and draw your own conclusions.) With the scores tied, that left Richard Truman to see whether or not he could win his game. A pawn up, but with only rook and opposite-coloured bishops left, he was unable to find anything, and drew shortly after the time control. Nevertheless, a 3–3 draw against such strong opposition was more than satisfactory. Notts 2 had a bad day at the office. Facing KJCA Kings (Kent juniors), they had a notional grading advantage, but by this stage in the season junior grades are usually well out of step with their actual playing strength. An early draw for Brian Thompson was followed by a run of defeats, with only Neil Graham’s win for consolation as the youngsters ran out 4½–1½ winners. The first team’s next opponents, Pontypridd, were very similar in strength to us. This time it was my turn to take a quick draw after missing a clear chance for a significant advantage. Richard Webster tried for too much and lost, but Rob was back in the groove and equalised the match score. Tony won queen for rook and bishop, and was clearly winning when his opponent failed by a fraction of a second to make the time control. Pete, however, failed to make the most of the same wing gambit idea that cost him a point in Round 6, and when he lost it was left once again to the hard-working Richard Truman to determine the result of the match. He was defending a difficult endgame of B + B vs. B + N for a while, in which his bishop was quite bad, but around the time control he established a solid defensive fortress. His opponent’s subsequent attempts to convert a non-existent advantage only led to further defensive options for Richard, and a draw was finally reached after more than five hours’ play. A second 3–3 draw thus concluded a very satisfactory weekend. Despite losing the previous match, Notts 2 were facing higher-rated opposition in SCS. Maurice Hill and Stan Cranmer drew early on, but the luckless Will Place found himself tackling a 180 graded opponent on top board and was unable to hold on. For a while the prospects for a point looked quite reasonable. Neil was clearly winning, and although his opponent played on two pieces down there was no chance of Neil missing out – he duly became the weekend’s only double winner. Bob Taylor had a difficult position that rapidly went downhill, so attention was focussed on Brian’s endgame. He appeared to have a small edge against an opponent graded 174, and he made strenuous but unavailing efforts to win. Unfortunately that proved his undoing – in an apparently dead R + P vs. R + P ending, he suddenly found himself losing his rook in a most unusual fashion, resulting in a 4–2 defeat. Neil is winning easily here, but he now finds an imaginative combination that picks up even more material: 1. Nc8+! Rxc8 2. Bd6+ Kf6 (2... Kd8 3. Be5+ Ke7 transposes) 3. Be5+ Ke7 (If 3... Kf5 4. Bxh8+ Ke4 5. Rd4+) 4. Rd7+ Kf8 5. Bxh8 and White went on to win. Nottinghamshire 1’s slim hopes of promotion rested on the possibility of an upset victory against Celtic Tigers 1. The Tigers boasted an IM on Board 1 and an FM on Board 2, outrating Notts all the way down, so it was a tall order. Heavy traffic meant that several players arrived a little late – and then discovered that our rooms were seemingly halfway across Berkshire. By the time that bags had been deposited, some 15 minutes had been lost. That, unfortunately, meant that the latecomers missed the excitement on Board 6, where Richard Webster had fallen into a deep hole in an obscure line of the French Defence and was already quite lost. He clung on for 90 minutes, but there was no escape. Here (with a warning to look away now if you are of a nervous disposition) is how it all went wrong. 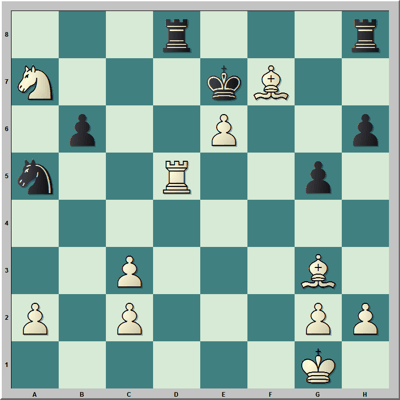 Robin Haldane–Richard Webster: 1. e4 e6 2. d4 d5 3. Nc3 Nf6 4. e5 Nfd7 5. Qh5?! At this stage all the other positions looked OK. I won material, but missed my one good chance chasing what looked like a forced win, but which turned out to be drawn by a single tempo. Then things turned against us – Richard Truman succumbed to nagging pressure, Andy Walker dropped a piece, and Rob Richmond was ground down by his titled opponent. Pete Mercs was last to finish, salvaging something from the wreckage by scoring the team’s only win – his first against an FM. The second team were placed in a triangular match against Bristol 2 and Celtic Tigers 2. They too turned out to be out of form, with only Bob Taylor and Maurice Hill able to pick up half points on the first day. See the Round 10 report for the triangular match results. With the pressure off, Notts 1 faced a tricky match against Oxfordshire 2. Once again, one game was over before most of us had settled down to play, but this time it went our way. Pete’s opponent, playing fast, miscalculated somehow and ended up losing material – all over in 17 moves. I neutralised my opponent’s King’s Gambit, but no more, resulting in a straightforward draw. Rob lost again in a French Defence, but Richard Truman restored the lead shortly afterwards. Attention then focused on Richard Webster’s game. Richard had been on the receiving end of a torrent of jokes about his first game over dinner on Saturday, and seemed to be facing a second defeat. However, his opponent then sank into deep thought, and if the outcome of the post mortem is to be believed, managed to avoid several winning ideas. Richard bounced back to win and secure the points, making Andy’s defeat immaterial. Notts 2 completed the second half of their triangular match with draws for Neil Graham, Brian Thompson and Maurice Hill. The match results were thus a 5–1 defeat against Bristol 2 and a 4½–1½ loss to Celtic Tigers 2. Over dinner on Saturday night, someone recalled that David Levens (absent this weekend) had registered 0/3 at the final weekend last season. This triple zero was thus christened a ‘Levens’. The inspiration for this was the Bulgarian GM Ivan Cheparinov’s disastrous 0/4 start at the FIDE Grand Prix tournament in Baku a week or two earlier, dubbed an ‘Audi’, which Richard Truman was able to top by recalling his own 0/5 start at the British Championship one year – an ‘Olympic’. (Picture the circles in the Audi logo and the Olympic flag and you’ll get the idea.) By Monday morning, four players were on course for a Levens – Rob, Andy, Tony and Stan. All, naturally, were hoping to avoid that fate. Notts 1 faced Metropolitan in the final round. A win would mean finishing in third place, although with only a slight rating advantage for us any result was possible. Richard Webster finished first, taking a draw to complete what we shall term a Full House Semi-Levens (a win, a draw and a loss). Shortly afterwards I too took a draw in a worse position, resulting in an Orthodox Semi-Levens (three draws). Then Richard Truman completed his own Full-House Semi-Levens with a draw. Rob then reached a relatively straightforward queen ending with an extra pawn, which he converted successfully, but Pete’s attempt to achieve an Anti-Levens (three wins), was looking shakier by the minute. In the end, his ramshackle defensive setup fell apart to leave the scores level with just Andy’s game remaining. An exchange sacrifice brought sufficient compensation, but his opponent survived some quite severe time trouble by returning the exchange. The resulting ending of R + B + 3P each was a little better for Andy, but with opposite-coloured bishops on the board there was no way through. A drawn match left us in sixth place at the end of the season – a satisfactory effort. The second team, apparently dozing all weekend, finally woke up on Monday and despatched Grendel’s Mother 5–1, although not without some alarms. CJ de Mooi (replacing Maurice) drew quickly, while Bob won and Neil drew. Stan had a clear endgame advantage which he slowly but surely turned into a win. Brian, however, appeared to be destined for defeat, while Tony faced some difficulties in converting an extra pawn. While shuttling back and forth between Andy’s game and the two second team games (our matches were in different rooms on different floors) I missed how Brian managed to survive a ferocious attack, and then watched as he turned a level position into an easy win. Tony, now safe (like all the others) from suffering a Levens, showed excellent technique to pick up a second pawn and gain a simple technical win.